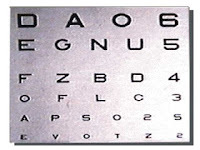 Do you remember a while back when I wrote about wanting to have the vision to see God's Preferable Future for my life? Well, I still do. But it's become a little clearer at this point. I can summarize it fairly easily actually. It goes something like this; #1. My call in life is to work with marginalized young people in some type of educational setting. #2. I am also called to confront the American church so as to help shake it out of it's complacency. Yeah, I know it's still rather broad and general. But at least it's something. So anyway, for this past Focus Of a Warrior meeting we had to take an inventory of our strengths. 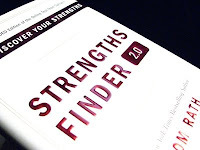 We are using a book by Tom Rath called Strength Finder 2.0. It is all based on research from the Gallup polling group. (So you know that it's solid) I had to go to a web site and was given 20 seconds to answer each of well over 100 questions. ("Go with your gut instinct," they said.) So I did, and it all ended up being both a blessing and a curse. I will post my top 5 strengths for you. I will edit it down, because otherwise it would be a bit long. I will also highlight the items that caught my attention in blue. My own snide editorializing will be in green. Finally, I will include the two questions that they have at the end of each explanation. Tell me what you think. By nature, you relish conversations with people. Discussing philosophies, theories, or concepts is exhilarating. (Yeah, that's true) You love to ask questions and be readily understood. As engaged as you are in the dialogue, you still make a point of pulling together insights so you can use this knowledge later. Chances are good that you repeatedly let people benefit from your sound reasoning and logical assessment of opportunities, problems, regulations, policies, or proposed solutions. Instinctively, you favor conversations where information, facts, or data are considered objectively — that is, emotions do not distort the truth. You pose questions, evaluate answers, and figure out how things work. Reducing an idea, theory, or process to its most basic parts provides you with many insights. Because of your strengths, you periodically recharge your imagination by creating original ideas for new projects. This might occur even before you have completed your current assignment. Perhaps you are happy if you can hand off to others your unfinished work. In some ways, you are like a surgeon who performs an operation but asks a competent assistant to close the patient’s incision. 1. As you read your personalized strengths insights, what words, phrases, or lines stand out to you? (The very first thing that popped into my head was that I am a Lonely Prophet!, even though that was not one of the words.) Objective, FACTS, Questions. 2. Out of all the talents in this insight, what would you like for others to see most in you? That I am trying to be objective & seeking the TRUTH!!!!! By nature, you are quite intrigued by history’s significant events and people. Information about global conflicts fascinates you. Driven by your talents, you sometimes research historic events to understand their impact on today’s people or events. Maybe knowing what occurred in bygone days helps you make sense of current conditions or the behavior of certain individuals. It’s very likely that you create a vision of the future by unraveling what happened in the past. You strive to understand the what, when, who, where, how, and why of events. You are determined to create a framework of facts so you can put things in perspective. Because of your strengths, you are a history buff — that is, someone ardently devoted to studying the past. You link people to events and trace timelines. You are likely to examine major battles from the perspective of foes and allies as well as neutral parties. 1. As you read your personalized strengths insights, what words, phrases, or lines stand out to you? What, when, who, where, HOW & WHY? 2. Out of all the talents in this insight, what would you like for others to see most in you? That I believe that CONTEXT is EVERYTHING!!!!!!!!!! Because of your strengths, you sometimes sit down with a book simply because you are eager to discover new ideas. Through the printed word, you have made the acquaintance of some very interesting fictional characters and real people. Instinctively, you put yourself in the middle of mentally stimulating conversations. You want to gather new ideas, discover new approaches, hear about new theories, consider new concepts, or apply new technologies. Often you are one of the early discoverers of innovations. Others can lag behind if they wish, but you consistently acquire knowledge. You exhibit little need to know precisely where all this information ultimately will lead you. It’s very likely that you regularly reflect on how you felt about your experiences as they occurred. You usually ponder how you felt afterward, too. Your emotional awareness sharpens your thinking. You are doubly blessed: (I AM????? Sounds more like a curse!) You think with your head and feel with your heart. Chances are good that you might be determined to keep abreast of certain categories of news. I guess I DO want to affirm other people’s humanity and what ever is BEST in them. Instinctively, you routinely isolate facts that link ideas, events, or people. You are especially sensitive to how one person’s optimistic or negative thoughts can affect the entire human family. This prompts you to pay close attention to what individuals and groups think and do. Because of your strengths, you might be determined to do good for people and/or the environment. Perhaps you are puzzled by people who cause harm without realizing they are hurting themselves. (True) You not only listen but also share your thoughts. In the process, you are likely to move beyond concrete facts. Your curiosity draws you (And gets me in a LOT of trouble) to speculate about theories, ideas, or concepts. To keep your mind fresh, you frequently quiz individuals who are equally fascinated with the intangible and abstract aspects of life. Chances are good that you rely on your awareness of others’ feelings, thoughts, and needs to guide you into and through partnerships. You bring people together. You help them discover reasons to cooperate and support one another. 2. Out of all the talents in this insight, what would you like for others to see most in you? I would like to bring Christians together over our common ground & common Savior…even John Piper & Greg Boyd. I got together with Pastor Scott a day ago after I had emailed him a copy of these top 5 Strengths. I wanted to see what he thought. My biggest fear is that this all makes me look like some snotty intellectual elitist. It's nice to know that I...along with everyone else on the planet, has some unique gifts and talents. The problem is figuring out how to use them. Anyway, I DO want to use these strengths for God. If I can find a way to harness them and put them to work with A) teaching/working with "Marginalized" youth, and B) challenging the American church, I think I will feel extremely fulfilled. So if I start pipping up, even gently, and questioning the churches' approach to some issues in our society, I know that I have to be prepared for a backlash. It's no wonder that I identify with Elijah so much. He wasn't very popular with the Powers-that-Be either. Oh well, at least Elijah and I both share depression from time to time. Yee HAW! I see these things in you. Tom shares 4 of your strengths...probably one reason you two have been such good friends all these years! It's fun to watch God reveal to you His plan & purposes...keep sharing your latest revelations.